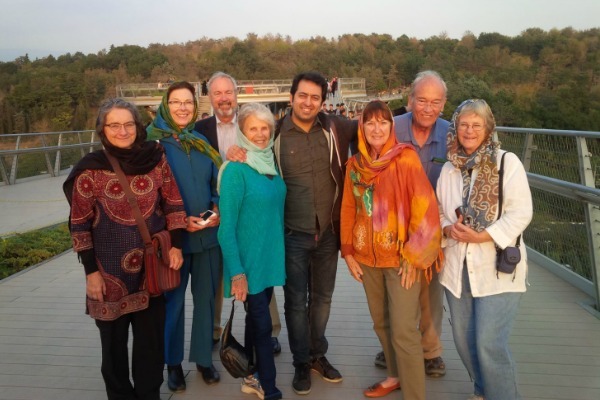 Peggy Bendel (in orange) in Teheran with the timpanist from the Teheran Symphony and a tour group organized by her client, @IranLuxuryTravel. In Part 1 and Part 2 of this series, travel editor/writer James Durston and I discuss the ethics of accepting free or deeply discounted travel. Are comps the price of doing business in a profession where the pay is low and travel pubs don’t foot the bill, or are they temptations no self-respecting writer should succumb to, no upstanding publication endorse? As you might have guessed from the way I phrased that choice, we pretty much come out on the side of necessary evil — emphasis on necessary, evil in quotes. In this last part of the series, we talk to the go-betweens in the business, the PR pros who connect the compees, i.e., the travel journalists, with the compers, their tourism clients. I’m pleased to have gotten as my interviewee one of the most successful people in travel PR, Peggy Bendel. Former head of the Tourism Division at Development Counsellors International (DCI), she now runs her own firm, Bendel Communications International. She’s worked with more than 50 US and international destinations — she was a principal in the I Love New York campaign –and more than a dozen hospitality industry clients, including hotels, resorts, and tour operators. The author of It’s a Crisis! NOW What: The first step-by-step crisis communications handbook for the global tourism and hospitality professionals, Peggy has won awards out the wazoo, including The Winthrop Grice Lifetime Achievement in Public Relations award from the Hospitality Sales and Marketing Association International (HSMAI). Full disclosure: I have been friends with Peggy for years; we met through the Society of American Travel Writers and bonded over the fact that we have dual citizenship in Tucson and New York. She is one of the nicest, sharpest, and most professional people I know, so I’m sure her press trips are excellent. I have never been on one, however. EJ: How do you decide, when a client offers a press trip, who to invite? PB: Many factors, primarily the theme of the trip and the client’s target markets/media. EJ: Do you push for press trips from clients or do they always come up with the ideas themselves? PB: Both: we look at newsworthy developments/special events at the client destination or company, travel trends that are relevant, and budget, then decide if we will do one or more group trips, a series of individual trips, or both. EJ: What are your expectations from writers when you offer a press trip? What coverage do you expect and what do you expect NOT to be included? If it’s a themed trip (an event or festival, annual celebration, outdoor adventure, family-friendly, etc. ), we would expect coverage of that theme in some way. It’s great if our partners can be included (hotels, restaurants, etc. ), but we understand – and so do they – that if it’s a chain hotel or run-of-the-mill restaurant, it’s not going to happen. We really love it if contact websites and phone #s can be included. If there’s a problem with the trip – weather, poor accommodations, or other – we would appreciate NO mention, though we want any problems or issues to be brought to our attention, so we can address them. EJ: If a writer goes on a press trip and you and the client are not happy with their coverage, what actions do you take? How will this affect future press trip invites for the writer? PB: If it’s the result of something that happened during the trip, I will usually have discussed any problem with the writer immediately. If it’s a surprise (I thought they had a good time, but the coverage indicates otherwise, or the coverage is not in the outlets or as extensive as we expected), I’ll call the writer or email them to schedule a discussion. We ask all writers to fill out a questionnaire at the end of their visit, so this doesn’t happen often. EJ: When inviting writers/media to events such as dinner, drinks, meeting clients etc, what do you expect to get out of it? PB: Deeper relationships, and learning something new on both sides. I expect writers to pay attention to any presentations by my client, not to be talking among themselves at the back of the room. And I’m VERY disappointed in no-shows: we call with reminders several times, including the day before and day of each event: just tell us if you can’t be there! Otherwise, we pay for food and drink that will not be used, and we tell our client to expect X guests, with a list of all acceptances. Simply not showing makes us – and the writers – look unprofessional. EJ: How many times can a writer attend events or press trips and not include coverage of the client, before being ‘unfriended’? Always welcome for events, as long as they behave well at them. Press trips are expensive, so we will always expect some level of coverage. We never “unfriend,” but we may not invite again, if there is no good reason for a lack of coverage. Every responsible journalist I know will not even accept a press trip if they are not reasonably confident they can produce from it: their time is too valuable, and they understand that our resources are limited. EJ: Many publications refuse to write content that’s been arranged via press trips. What are your views about this? PB: If those publications–or media outlets, since it applies to broadcast and online, too–had a sufficient budget to send writers to cover stories, that’s fine. But few today do, and so I consider it a disservice to their readers to expect writers to pay for their trips, and then be paid a relative pittance for their stories. The writers will need to be part-time travel writers, with a traditional job, or the beneficiary of a trust fund. It’s well known in the PR field that certain media outlets will embrace this policy officially, but accept “discounts” for their staff or freelancers that are so close to free as to be laughable. I have no problem with stories that identify who hosted the trip, and believe that is the appropriate way to handle this situation. Tell me a little about the shift from working with a large firm to running your own firm and how it impacts your approach towards press trips? I headed the Tourism Division at Development Counsellors International (DCI), the leader in marketing places, from 1985 to 2009, when I launched Bendel Communications International. While 99% of our clients at DCI were destinations, from South Africa to Sweden, Palm Beach to Portland (both OR and ME! ), my clients now are tour operators, hotels, attractions and other entities in the tourism realm. My newest client IS a destination: Las Cruces, NM and it’s fun having that scope. Working with smaller private-sector entities has given me a real sense of the bottom-line impact PR can have: when the phones ring after a particular story hits, it’s a thrill, and I know it makes a difference. My smaller clients struggle to afford press visits, since with a tour operator, for example, their space is often limited and every hosted journalist means a paying client who cannot join the trip. Therefore, I must be very conscientious about the value a particular writer can produce. Every now and then, I was invited on a journalists’ jaunt that fit the “junket” stereotype, down to the lavish suites, umbrella drinks, and large swaths of free time. Far more often, however, my familiarization (fam) tours resembled sleep-away camps run by speed freaks. In an elaborate juggling act, trip organizers would try to anticipate every conceivable interest of an eclectic group of writers while satisfying the publicity demands of the destination or hotel picking up the tab. It was a lose–lose proposition. Running journalists through a frenetic gauntlet of activities only made them irritable and thus less likely to pen glowing reviews. When you do group press trips, how do you balance the needs of your client with those of the journalists? PB: In most cases, the needs of my client ARE the needs of the journalist: they understand that giving the journalist the best possible authentic experience will result in the most impactful stories. When they diverge, I explain to one or the other why an exception must be made, or a desire cannot be accomplished. Honesty is still the best policy! EJ: At what point does a journalist who produces good articles but is a pain to deal with get banned from press trips? Or do you hold your nose and invite that person back – at the risk of putting off other journalists with good outlets? There are very few journalists in that category, but they do exist! I would plan an individual trip for such an individual, which can often be a special treat for them, while avoiding conflicts. In the few cases where that’s been necessary no one has refused that offer, and other journalists aren’t aware it ever happened. EJ: You’re too kind to my fellow travel journalists, Peggy. In my experience, there’s a prima donna or don on every trip, someone who turns up late, is overly demanding, is rude to the hosts—who makes life miserable for everyone else. But that’s why you’re in PR and I’m a curmudgeonly ink-stained wretch. Thanks so much, Peggy. Part 4 is coming up soon on James Durston’s Travel, Write, Earn. 1) Regardless of who’s paying the expenses, business travel is business travel. If the IRS doesn’t regard it as compensation, why should the writer, editor, or publisher? 2) If the publisher is covering the writer’s expenses, the writer is under just as much pressure–arguably even *more* pressure–than he or she would be if the expenses were covered by a destination, tour company, cruise line, etc. I remember one case a number of years ago where the travel editor of my local metropolitan newspaper talked her bosses into spending more than $2,000 to send her to an upscale party event in France. Having run up such a big bill, she obviously had to write about the event (regardless of whether it turned out to be worth writing about) if she wanted to keep her bosses happy. 3) Most travel coverage isn’t criticism, and most people who write about travel for a living regard travel as an adventure, not as a job that involves walking around with an inspector’s clipboard. If I spend a week on a river cruise in France or visit the Mercedes-Benz Museum in Stuttgart on a press trip, I’m likely to enjoy the experience–even if it doesn’t go exactly as planned. The claim that a travel writer can’t write “objectively” about, say, a comped week of hiking in the Swiss Alps or exploring the Australian Outback is as silly as it is pretentious. 4) Those who keep insisting that comped travel means dishonest coverage should demand that all travel writer and editors pay their own bills (no expenses paid by publishers, and no artificially low “media rates”). Or maybe they should just suggest dumping travel writers altogether and replacing their work with paying customers’ posts from TripAdvisor. All excellent points, especially #2. One quibble: Writers of guidebooksdo walk around with metaphorical inspector’s clipboards. But that just means that we/they don’t waste precious space on including sub-par places or attractions. And that we *really* couldn’t do our jobs without comps. Very helpful. Your practical viewpoint about publishers who refuse ‘comped’ coverage is spot on. I welcome FAM trips, especially when ‘free’ time is included & often schedule an extra day to dig deeper into stories – on my dime. Press Trip Divas?! I’ve met a few. Your patient work around is best for all. When all senses are on alert for story, the drama is depleting. Thanks for weighing in! Yes, free time to explore stores is always much very appreciated. My main gripe with many trips is not being able to pursue other angles.